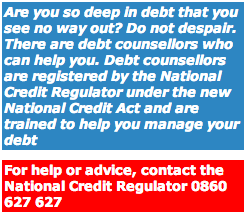 The first step a debt counsellor will take is to help you apply for a debt review. You and the counsellor will look at your situation by listing all your debts, as well as your monthly income and expenses. Before the counsellor can process your application, you will have to pay a R50 application fee. The National Youth Service programme has called on all provinces to train their youth to help government reach Jipsa’s goals of developing skills and speeding up economic growth. In addition, it will break the cycle of unemployment by helping unemployed youth in the provinces to find jobs. The training programme is a year-long project that gives the youth a number of practical skills ranging from bricklaying, plastering, mechanics, carpentry, plumbing, welding and electrical work. Trainees get help from mentors and supervisors during the course. After completing the courses successfully, they get certificates that are recognised by the Further Education Colleges (FET). To apply for a credit review, you have to fill in an application form. You will need copies of your ID, proof of income or salary, three months bank statements, account statements, letters from credit givers demanding payments and all credit agreements. The debt counsellor will list all your monthly expenses like food, clothing, transport and school fees. Within five days, the counsellor will tell your credit givers and credit bureaus that you have applied for a credit review. After that, you may not apply for any credit again until your name has been cleared. If your application is accepted, the credit bureaus will mark your name as a credit review applicant. The credit givers will then stop phoning you or writing letters, and may not take any legal action against you. The counsellor will now help you work out a re-payment plan that you can afford. He or she will re-organise your payments and tell the credit givers how much you can afford to pay. The credit givers must say whether they agree to accept the reduced amount. If they agree, the counsellor will prepare a consent order to be sent to the court to confirm that the credit providers accept the agreement. If they don’t accept the proposal, the counsellor will take them to court where the magistrate must make the final decision. The counsellor will then appoint a payment distribution agency to collect your money for the credit givers every month. This can be done through a debit order at your bank. Counsellors are not allowed to collect money from you for credit givers. Once you have paid all the debt, the debt counsellor will issue a clearance certificate. This will go to the credit bureaus to delete all your records and clear your name. When this has been done, you can start afresh. You may now apply for credit again, but you must do it responsibly.